Within Teamwork Projects, you can export the Gantt chart related to your project to either Microsoft Project or Gantt Project. You can do this by clicking into the Tasks area. Within the left pane under reports select Gantt Chart Export. Once you select this you will be presented with an option to choose the export type you wish. 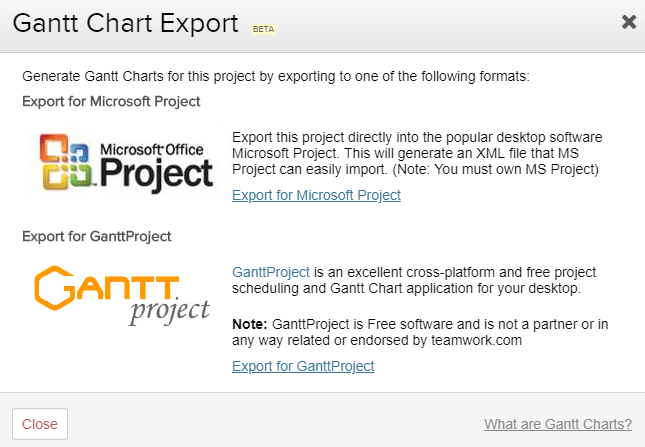 Note: The exported file types are .XML for Microsoft Project and .GAN for Gantt Project.